"For many music education students in the CU Boulder College of Music, the new semester means fine tuning lesson plans for this year’s CU Middle School Ensemble program." notes Outreach and Engagement News. The program, which begins Feb. 1, provides an extra-curricular performance opportunity for band, orchestra and choral students in grades 6 to 8, which this year will focus on multicultural and world music. Students rehearse on Wednesday nights at Nevin Platt Middle School and perform a final concert on April 28. The ensemble costs $50 and scholarships are available; online registration is open through Jan. 6. The program was started in 2007 to provide undergraduate students with additional opportunities to practice their teaching skills with K-12 students, to help high school musicians learn about teaching, and to supplement middle school music instruction, said David Rickels, assistant professor of music education who is the program’s main faculty supervisor. Margaret Berg, associate professor of music education, and Leila Heil, assistant professor of music education, are also faculty supervisors for the program. What began as one wind ensemble, has now grown to two wind ensembles, a string orchestra and a choir, serving about 120 middle school students in the Boulder area and involving about 25 undergraduates, he said. 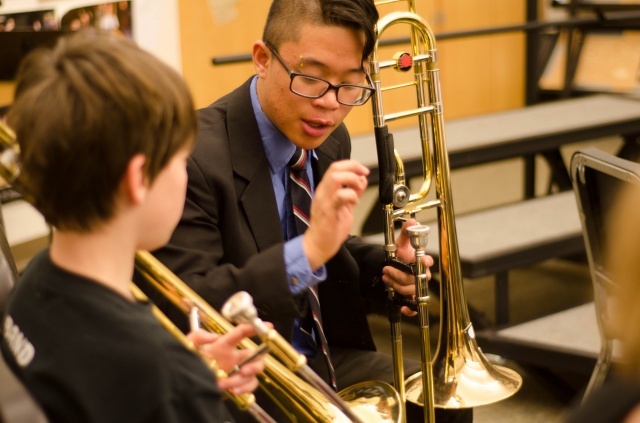 The program is funded through the Hoover Fund for Music Education, as well as a CU Boulder Undergraduate Research Opportunities Program grant and a CU Boulder Outreach Award, which connects faculty research, teaching and creative work with community needs.